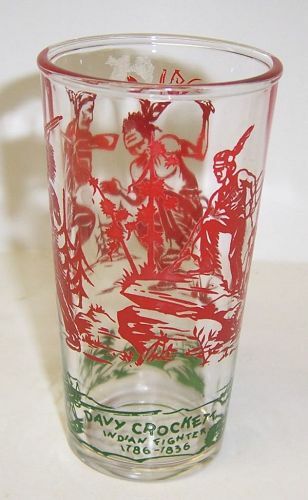 This is a really great white Davy Crockett 3 Inch Childs Handled Mug made by Anchor Hocking Glass. 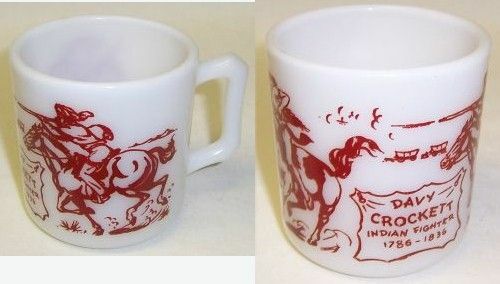 This Mug features Davy Crockett on a horse, an Indian on a horse and a panel in red letters: DAVY CROCKETT INDIAN FIGHTER 1786-1836. Be sure to search our other Davy Crockett items available. We guarantee items to be as described. THANK YOU. This is a really nice little green Interior Panel 2 inch high X 1 3/4 inches in diameter Childs Toy Tumbler made by Akro Agate. This Tumbler is in very good condition with no chips or cracks. We guarantee items to be as described. Feel free to email any questions. THANK YOU. This really nice Childs Ranger Joe Ranch Mug was made by Hazel Atlas. This Mug is milk white with blue design and lettering. It is signed HA and is in very good condition with no chips or cracks. The cowboy design and lettering is all very good. Be sure to search our other childrens items available. We guarantee items to be as described. Feel free to email any questions. THANK YOU. 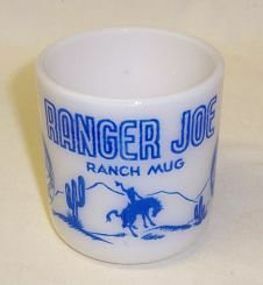 This really nice Childs Ranger Joe Ranch Mug was made by Hazel Atlas. This Mug is milk white with red design and lettering. It is signed HA and is in very good condition with no chips or cracks. The cowboy design and lettering is all very good. Be sure to search our other childrens items available. 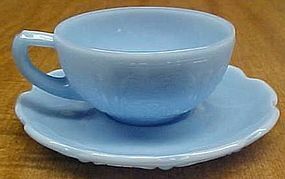 This pretty delphite blue Cherry Blossom depression glass Childs Cup and Saucer set was made by Jeannette Glass from 1930 to 1939. The Cup measures 2 7/8 Inches in diameter. The Saucer measures 4 3/8 Inches in diameter. 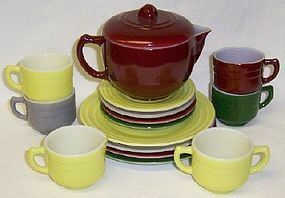 Both the Cup and Saucer are in very good condition with no chips or cracks. Be sure to search our other Cherry Blossom available. We guarantee all items to be as described. Feel free to email with any questions. THANK YOU. 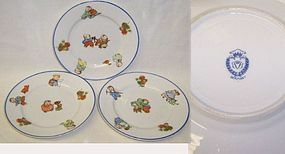 These are three, vintage, German childrens dishes in the Baby Fats collection. The plates each measure 5 1/4 inches in diameter. All three plates are in very good condition with no chips or cracks. The childs decoration and blue trim are very good. 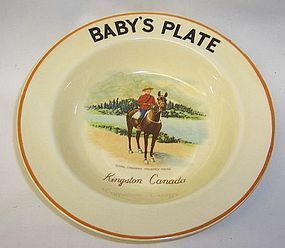 The plates have a blue Germany back stamp with a crown in the stamp. We guarantee all items to be as described. Feel free to email any questions. THANK YOU.